"Star Wars: The Last Jedi" roars into theaters, full of the elements fans love and demand. The John Williams score produces goosebumps. The earnest actors include Oscar Issac as a hotshot resistance pilot, fighting alongside John Boyega and Kelly Marie Tran in an army directed by Carrie Fisher & Laura Dern. 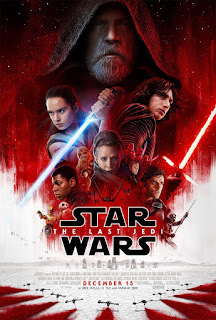 They fight an empire of delicious villains, including Andy Serkis, Domhnall Gleeson and Adam Driver, whom we learned in the previous chapter is the son of Carrie Fisher and Harrison Ford, gone to the Dark Side. While all this battling takes place, Daisy Ridley finds Mark Hamill somewhere in the galaxy and pleads for Jedi training. There's a scene in a casino that reminds us of the original Cantina (several of the sets look like copies of "The Empire Strikes Back.") There's also a visit from Yoda! and Benicio Del Toro turns up as a rogue space thief in the mold of Harrison Ford's original Hans Solo. The new film aims to satisfy fans, and succeeds. The "Star Wars" series continues in a loop leading to the next and final chapter. "The Last Jedi" gets us closer to conclusion, without delivering anything new or shocking. "Star Wars: The Last Jedi," 2½ stars, rated PG-13. Does it deliver what it promises? Does what it needs. Is it entertaining? For fans. Is it worth the price of admission? Get in line now.